Story originally linked by porthawk. (Eric) Bossi: Kansas doesn’t have any commitments, but it is starting to fire up on the recruiting trail and is anybody really going to bet against it making a run? Top 35 Samuell Williamson was on campus last weekend (he sees Texas A&M this weekend) and while he didn’t commit, the Jayhawks are still in a good spot. The origin post has, of course, been updated for the new ranks. What I did not include in the OP is how much each KU offeree changed from the last published rankings. Messes up the tables for future use. So here I have added the ^ v - info for this newest version. That would be an excellent class if KU landed those 5, and would leave at least one (1) scholarship still available for the 2019 class for Self & Co to make it even better. Unless they come up with a transfer for scholly 6, of course, which will not affect the class rating at all.. Here are the changes for all currently uncommitted KU offerees that I am aware of today. There were some big ups and downs this time around. Here is a look at who made double digit leaps forward in this rendition of the Top 150. * indicates a KU offeree. >=^nn indicates a new name in the Top 150, so his leap is at LEAST (151 - New Ranking). NB: #50 Malik Hall was not previously ranked in 2019 because he reclassified from 2020 to 2019 since the previous rankings. I do not know what his 2020 ranking was, but (a) I do know it was good and (b) it wouldn't be appropriate to compare them for this purpose. what happened with Kadin Shedrick? cone, and here he come from nowhere, right out of the cheap seats... dribbling. Made quite the impression on Ethel and everyone else at the games, I tell ya! Last Edit: 7 months 6 days ago by HawkErrant. Just goes to show how HS recruiting rankings can totally miss some players. 247Sports and ESPN pages (when you can find them, ESPN only goes back to 2007) shows similar results. Of course, this is only looking at the positive misses, if you will -- the players who were great who were missed. The negative misses are there as well (e.g., Rivals 2015 #21 Carlton Bragg), but I'm not going to dwell on them. Because my point is that just because someone is not ranked in the Top 100 does not mean that they won't turn out to be a real gem of a college hoops player. Self & Co have shown time and again that they have an eye for talent. Here's to their continued success in getting that talent to come to Lawrence! 1. Former KU prospect Zach Harvey has transferred from Topeka’s Hayden High to Prolific Prep in Napa, CA, and is reclassifing to 2020. 2. 5* PG Nico Mannion of Phoenix committing to Arizona. Both moved to the Former Recruits section. Quite the surprise for many, especially as reports were that KU is (was?) supposedly his “dream school”. The OP has been adjusted accordingly. In other news, KU had an in-home visit Sunday with Overland Park, KS 4* SF Chris Braun (6-6/180). Bossi on Braun — it’s his feeling that KU is going after him very strongly. 1. Rivals and 247Sports have Braun as a SF. KUSports and Verbal Commits have him as a SG, and ESPN has nada on him. I've read little about him specifically being a 2, it's always been him as a 3 until now. Granted going small and using an SG at the 3 is not unheard of in recent years at KU, but I'm more inclined to go with what Rivals and 247Sports apparently believe is the better descriptor. 2. Tait believes this year's recruiting class will be from 3-5 strong. I disagree. I believe it will be AT LEAST 5, more likely 6 (see the OP), and possibly more depending on how the season plays out. Rivals analyst Eric Bossi states there are no off-court issues with SW - "There are no off the court issues with Sam Williamson, known to be a very high character kid." He also writes that he would "leave it as Kansas made their case to him, gave him time to ponder and decided they weren't going to wait any longer." Twitter buzz is he is committing tonight, popular opinion is it's Louisville. Louisville it is. Best of luck to the kid. Barnes the Magician strikes again! Spoke with 4* G Isaac McBride after Late Night before his flight took off, and reports Isaac loved everything about his visit and KU. Shay cannot definitely say that McBride will choose KU, but he expects McBride to be a Jayhawk. Young man was heading home to talk with his family, then see how he feels. Again, Shay feels very good about McBride. Re: 4* SG Cassius Stanley, Shay spoke with his father who reports "Visit was outstanding. Great school, great staff, great fans." Shay also reports someone he trusts thinks Cassius will be deciding between KU and Oregon. Nothing else to add at present. Zeke Nnjai cuts his list. Must confess to liking his idea. 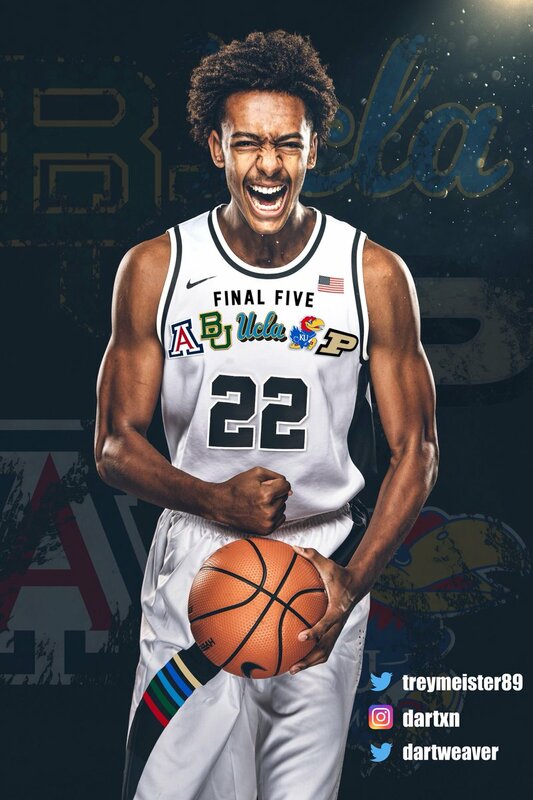 Also thinking I will be surprised if we get him, especially if we also get Matthew Hurt and Jeremiah Robinson-Earl, both of whom KU has been courting forEVer. Welcome to The Hill, Mackey! OP updated for KU recruits choosing someplace else (moved from OFFERED to FORMER RECRUIT table). #124 4* PG Markese Jacobs had committed to KU several years ago, but in August chose to reopen his recruitment. At the time I moved him to the OFFERED table, but recent chatter is that he and KU are going separate ways, so I moved him to the FORMER table. Rivals National Analyst Eric Bossi reports that Lester Earl’s son has cut his list to KU and Nova. Arizona, tarred ones and golden domers all on the cutting room floor. Though JRE gave no indication of a decision date having been set, Bossi expects a decision soon. Remember the early signing period runs Nov 14-21. Jay Wright and Nova are relative newcomers to the JRE sweepstakes, but it easy to see the appeal. Hopefully JRE’s senior year at IMG has helped reinforce how nice it would be to play for the hometown and long term favorite KU. Definitely trick, with Lester Ear's son Jeremiah Robinson-Earl commiting to Villanova today. And JRE has said it was not the investigations. According to him if they had been a factor KU would not have been in his last two. Here's hoping Self & Co can land his other top 10 recruit Matthew Hurt, then close out the rest of the 2019 openings with some excellent basketball players. Stanley is down to KU, UCLA and Oregon. Here is a Zagsblog article from yesterday talking about both his UCLA and KU visits. Oregon visit will be this weekend. Keeping my fingers crossed, would love to see this kid as a Jayhawk. McBride and Braun to sign on Wednesday Nov 14. No other names as yet.